We are one of the leading manufacturers, suppliers, and exporters of Disposable Gloves. These gloves are manufactured using superior quality rubber which is sourced from reliable vendors of the market. All these gloves are developed in accordance with industry laid norms and guidelines. Moreover, our range is offered to clients in various shapes and sizes as per their needs. Our entire range of products are thoroughly scrutinized under the vigilance of quality examiners so that only flawless gloves are delivered at clients location within the committed time-period. 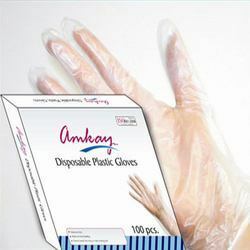 We offer Plastic Gloves with paper & we also make Long Sleeves Gloves mainly used for health & veterinary field. Usage: food service, restaurant, hotel ,household cleaning,etc. In order to fulfill the ever changing demands of our clients, we have been engaged in offering a wide gamut of Disposable Plastics Gloves. These gloves are manufactured using high quality plastic in compliance with industry laid norms and guidelines. The gloves offered by us are disposable and are widely used in hospitals. To meet the diverse demands of our clients, we offer these gloves in various shapes and sizes at an industry leading prices.